“Members of the public are welcome”. We have had a problem with our website’s contact page which has only come to light tonight. When someone sends us a message using the contact page the message is automatically saved on the site and at the same time a message is sent to the administrator to say a new message has been received. The administrator would then deal with the message. Unfortunately we have not been receiving any indications that new messages have been received and subsequently messages have gone unnoticed and some unanswered. The fault has now been rectified and the page is now working as it should however there are a lot of messages to go through and there may be a further delay before all messages are read and acted on. So please bear with us for a further short period as we endeavour to answer all messages. If you have contacted us and you are expecting a reply and do not receive one within the next two weeks please contact us once more. Once again we apologise for this and hope it did not cause anyone too much distress. For this we sincerely apologise. Hi, some news from BHPG 16 photos have been added to the ‘Recently Added’ page, link below. Thanks to Carol McVicar for the photos of some well know Benarty faces. Also many thanks for using the BHPG website. 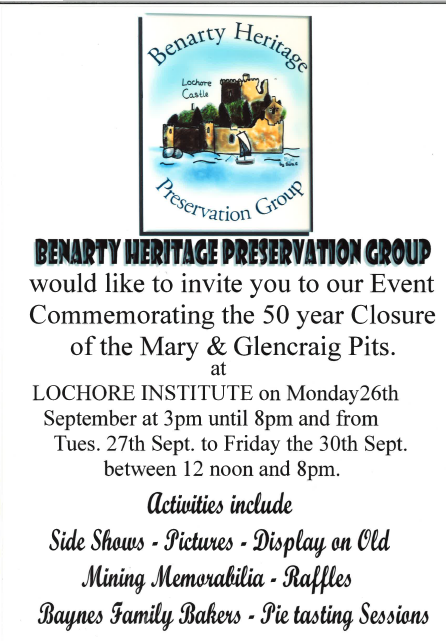 As a user of Benarty Heritage Preservation Group I’d like to inform you that new photos have been added to the galleries. 23 photos of Auld Shank regulars have been added to the People Gallery while a photo of the Auld Shank has been added to the Ballingry Gallery. These photo come courtesy of Stephanie Faulds. If you have any old photos you’d like to share with us then please contact me. It is with great sadness and a heavy heart that I have to inform you of the death of Jim Campbell, former chairperson of Benarty Heritage Preservation Group. Jim was well known in local history circles and was the man responsible for igniting my passion for local history. He was also the person who supplied most of the material for this website. Jim will be missed by his wife, Rosemary, his family and friends. I have add some more photos to the ‘Recent’y Added Gallery’ thanks to Brenda Coyle and Billy Marr for these. Over 50 photos have been added to the BHPG ‘Recently Added’ gallery and thanks go to Brenda Coyle and John Ross for these photos. If you have any photos you think would be of interest to others then please get in touch with me.